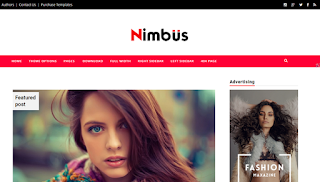 Nimbus Blogger Template is a high quality, use-friendly, business blog Free blogger template. A must try for daily writing blogs, Viral News Publishers and Magazines. It comes with standard features that a simple blog needs. We haven't added any fancy features like we always do with our other templates, instead we have gone with keeping it simple approach and the prime focus is at the "content". Wow nice Template. Actually i was looking for this kind of template.Now i got it. Thanks for sharing. I will use this template on my blog.